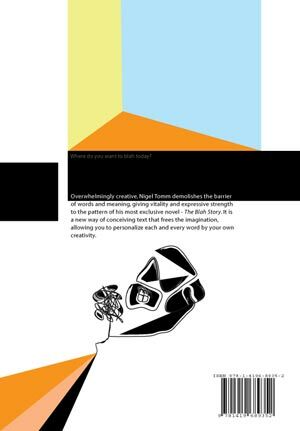 The fifteenth volume of The Blah Story by Nigel Tomm was published in 2008. 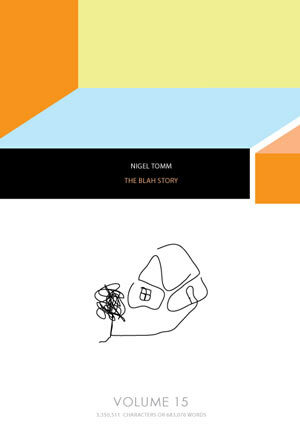 Nigel Tomm safely develops abstract literature’s concept and continues his avant-garde novel The Blah Story. Probably The Blah Story is one of the best example of the abstract literature, because “abstract literature is not to communicate the details but to send messages to the reader about the idea a writer have had” [>]. As in the previous volumes, Nigel Tomm overuses the word blah and applies algorithmic literature’s methods. Book statistics: The Blah Story, Volume 15 contains 683,076 words; 3,350,511 characters (with spaces); 812 pages. Some trivia about The Blah Story: Volume 19 contains the world’s longest word, Volume 10 contains the second world’s longest word, Volumes 16, 17, 18 and 19 contains the world’s longest sentence, Volume 4 contains the second world’s longest sentence, Volume 8 contains the world’s longest poem, Volume 13 contains the world’s longest drama. The cover of The Blah Story, Volume 15. The back cover of The Blah Story, Volume 15. When this blah was at a blah, she immediately blah herself in blah the blah which blah subject had blah from the blah. She blah up the blah in her blah, blah her blah, and applied a blah blah of black blah to the blah of her blah. The blah soon grew blah blah. Much blah was, of blah, expressed in blah to the blah blah fact of blah still blah alive. Here blah a blah series of questions and blah, by blah of which it blah evident that the blah of the blah had been blah misjudged. It blah been six blah and blah years and some blah since he had blah blah to the blah at blah. ‘In what?’ said the blah. ‘In blah blah,’ persisted blah. "The sky catches a human component of the contemporary poetry."